A crash course in fabric, fibers, and their use and care. The way the fabric feels. Is it comfortable? Would you want to wear it? Do you like the weight of the fabric? Is it too heavy? Is it too light? What will it take to launder this fabric? Is it easy care? Wash and wear? Dry clean only? Natural Cotton, silk, linen (flax), hemp, leather, wool, and luxury fibers such as alpaca, angora, etc. Natural fibers are my favorite fibers because they are natural! Natural fibers are easily dyed and that makes them fun for home projects. Some natural fibers, like cotton, breathe and launder well, making them great for everyday wear. However, other natural fibers, such as the luxury fibers, require dry cleaning. Natural fibers have a tendency to easily shrink, fade, wrinkle, and warp. Regenerated fibers are man-made fibers from plant or protein based materials. Common materials used to create regenerated fibers are corn, soy, casein, and wood pulp. They are created by chemically inducing a transformation of a natural polymer, thus yielding a regenerated fiber. More often than not, cellulose fibers are created to have desirable qualities, such as drape and durability. Synthetic fibers are produced entirely from chemicals. Often times, synthetic fibers are strong, elastic, and lustrous. However, synthetics can be produced to have a variety of characteristics. For example; the water proof fabrics used to make a rain coat. These type of fibers are generally easy to care for and are durable. Blends are created when two or more fibers are spun to create a finished textile with desirable qualities. For example, a Poly/Cotton blend washes, wears, and breathes nicely. It also doesn’t wrinkle as much as 100% cotton. Blends often capitalize on the pros of each fiber. Woven A woven fabric is made on a loom. Woven’s consist of lengthwise yarns, known as the warp. And, crosswise yarns, know as the weft. The warp of the fabric is the strongest and the weft, or the filler, is the weakest. Despite this, woven fabrics are very stable. However, when a woven is cut on the bias, or diagonal, the fabric tends to give a little. Knits Knits are created by intertwining a series of loops and crosswise stitches, or ribs and courses. Knits have variable amounts of stretch, making them extremely comfortable. Woven fabrics require more built in shaping than knits. 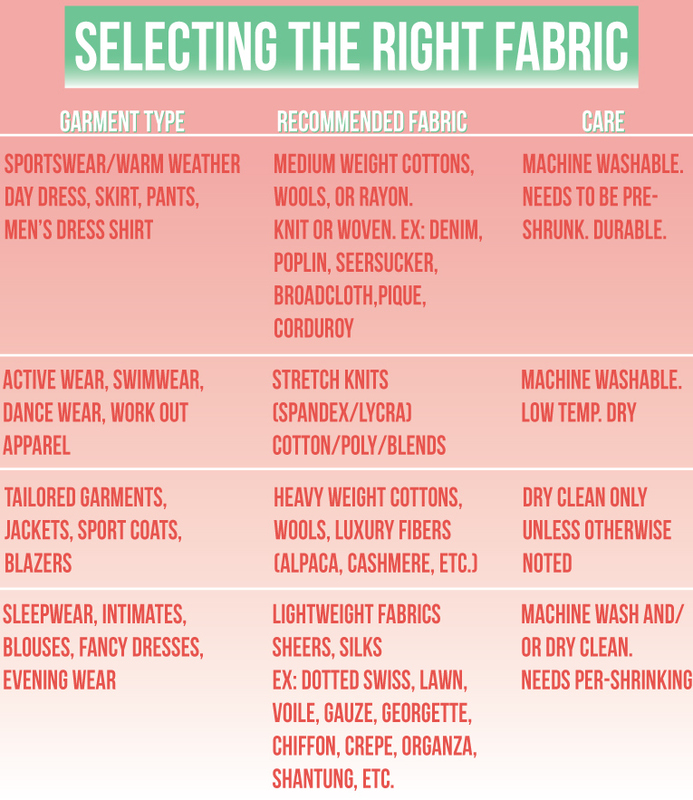 However, both fabrics are equally desirable depending upon the garment type. Lengthwise grain (straight of grain) The lengthwise grain of the fabric is parallel to the selvage edge of the fabric. The selvage is also known as the warp. Selvage edges are woven tightly. Crosswise grain (cross grain) The crosswise grain is perpendicular to the lengthwise grain or selvage edge. Cross grain are also known as the weft. Bias The bias is when the fabric is folded at a 45° angle. Bias cut garments have more stretch and have a graceful drape. Selvage The narrow, firmly woven, finished bit on the end, or crosswise edges of a woven. The selvages will not fray unless cut. IF YOU LIKE THIS POST, PLEASE COMMENT, SHARE, AND PIN! Thanks for finally writing about >Fabric 101 <Liked it! Great job. This reminded me of the course that i had in college. I total forgot about most of the things you mention here. Thank you so much for the trip back into college. I really enjoyed recapping on all this! I remember learning about it at school and being fascinated then. My favourites are also natural fibres, although they all have their place.